This statistic presents a ranking of selected online companies based on total digital advertising revenue based on their annual reporting, excluding virtual currencies and goods. In 2018, Facebook earned 55 billion U.S. dollars in digital revenue through online advertising. During the same period of time, search market leader Google generated 116.3 billion U.S. dollars through digital advertising channels. 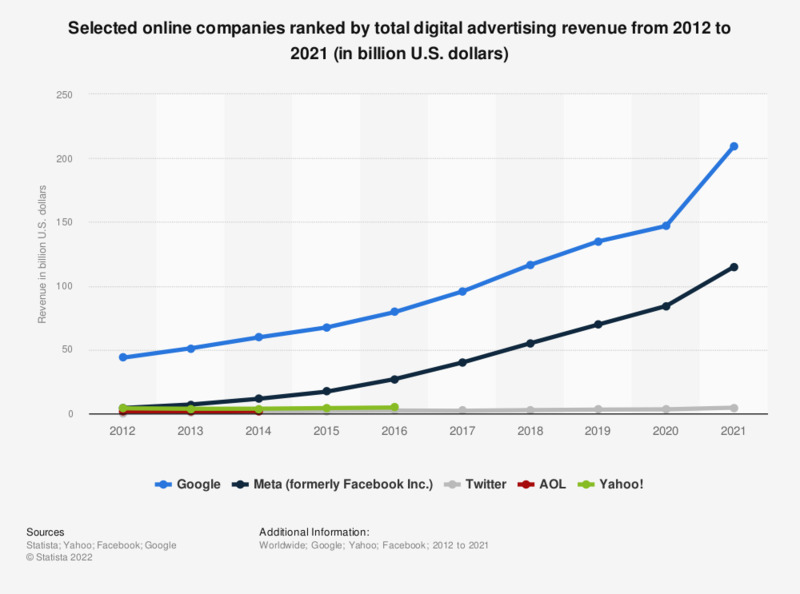 Data is based on the respective companies' Form 10-K.
Yahoo digital advertising revenue is calculated from search and display revenues, excluding other revenues. Figures regarding 2014 to 2015 have been restated due to Yahoo's new revenue structure. Everything On "Digital advertising in the U.S." in One Document: Edited and Divided into Handy Chapters. Including Detailed References.